Universal Newsline - Business, Lifestyle, Entertainment : This monsoon, it’s time to pep up your collection with all that’s blue! This monsoon, it’s time to pep up your collection with all that’s blue! In the Mood for the Blues! Are the grey, rainy clouds dampening your mood? 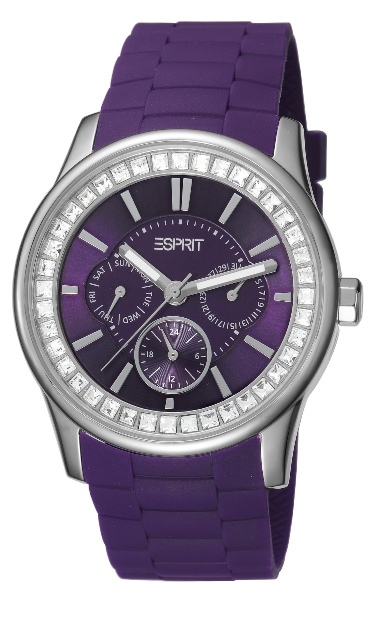 Here is your chance to beat the monsoon blues with cool and exciting timepieces from Esprit Timewear. The soothing hues of these wrist wears will charm you into embracing the blues with aplomb. Esprit has unveiled its new range of watches in various shades of blue, purple and grey- a perfect time keeper, this monsoon. Up your style quotient and step out in vogue wearing these uber cool designs to create a chic impression. With colours and designs that are perfectly in sync with the weather, this collection packs in the right amount of glamour and elegance. Whether it is silicon straps, PU straps, embellished dials, or multifunction features, you can choose your pick from this wide range of selection. Available in various styles and prices for both men and women. The ever loved, Colours of California inspired Marin 68 watches, this time around have a special offering in Blue Petrol & Aubergine, the perfect colours for this monsoon! The Silicon strap & crystal stones on the dial make these watches an uber cool adornment for everyone out there! A Watch like never before, Loft Purple, is a Multi Function Timepiece, with a 40 mm Dial. Its for those who are like it Big ! To perfectly complement the features and style of this watch is the PU strap, the interesting usage of the metal links and ofcourse the perfect colour of the season - Purple. Get ready for all the attention. Glamorously fashionable, seasonally trendy ! Starlite range of watches come in exciting colours, the season’s best being Purple. This ones a multi function watch, glittered with crystal stones and PU Strap and a perfect wear for everyday or for a nightout! Clash – a sporty multi-function watch with stainless steel case measuring 45 mm is waterproof up to 10 ATM. The finely detailed, softly rubberised surface creates a very distinctive bezel. And the ultra-soft PU strap is in perfect colour harmony with the two accentuated eyes on the dial, blending well with the colours of the season. Pure elegance combined with a distinctive touch – meet the Modesto Models. The round case with a 44 mm diameter and the chiselled collars for the strap add up to a strong character. The matt dial with fine hour markings and sunken elements shows pure love to detail. And thanks to the perfect Blue – from classic or sporty to trendy – every man will find his personal masterpiece in this model. Elegant, yet masculine, Cerritos Chrono Blue is a perfect wear for all those who like to flaunt it. The perfectly laid, soft blue leather strap completes the look for this monsoon.